Inspired by the noble cause of education and philanthropic zeal, a group of Kolkata-based like-minded industrialists joined hands to form a public charitable educational foundation – Kalyan Bharti Trust (KBT) to further their dreams of serving the Society. The vision of the Trust is to prepare dynamic and caring citizens to meet the challenges of a global society while retaining their traditional values. The primary mission of the Trust is to create a center of excellence in education, which, in keeping with the rich heritage of India, will stress the simultaneous development of body, mind and soul and endeavour to create compassionate, responsible and innovative global citizens who are committed to the development of India. The latest addition to the list, The Heritage College for general Degree Courses, has started its journey from the academic year 2016-17, with a view to become a world-class institution with ample opportunities for research in science and social sciences, by instilling a sense of life-long transformative learning in the graduate and creating an intellectual community to serve the nation. 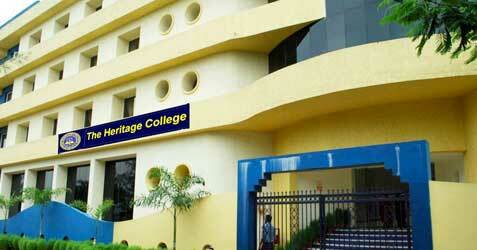 The college is affiliated to University of Calcutta. The Heritage Campus is located at Chowbaga Road, behind Ruby General Hospital, Kolkata and halfway between the Eastern Metropolitan Bypass and the Basanti Express way. A harmonious integration of valued traditions with modern outlook is the guiding principle behind the development of the academic environment that constitutes the basic philosophy of the Heritage Group of Institutions.